But Clark was never foolish enough to claim—as so many self-deluding pop stars do—that the songs are out there in the ether waiting to be captured by the right antenna. Those pop stars failed, he knew, to recognize the sudden appearance of inspiration as the prompting of their own subconscious. And by pretending that the songs arrived already finished, those lazy pop stars rationalized their unwillingness to do the work of crafting an inspiration into a finished song. “I work on songs all the time,” he told me. “I still work on songs that were written 20 years ago. If there’s a line that I never liked, and all of a sudden a better line pops out of my mouth on stage, I’ll use the new line forever after. For example, one of my favorite songs is ‘Better Days,’ but there was a line that never suited me. I tried to change it but I couldn’t think of a better one, so I went ahead and recorded the song as it was. The original version was the title track of Clark’s 1983 album, the last part of a trilogy he did for Warner Bros. Records. All three LPs were later released as a two-CD set on Philo, Craftsman. That word defined both his process and his achievement better than any other. The revised version of “Better Days” can be heard on 1997’s Keepers—A Live Recording. “Keepers” was Clark’s phrase for songs that are worth recording. Like a fisherman, he implies, you hook and reel in a lot of songs from the subconscious but most of them are too scrawny and ill-shapen to take home. So you throw them back into the pond with instructions to eat a lot of plankton and fill out. He learned that—and so much else—from his best friend and greatest influence: Townes Van Zandt. They met in 1963, the 21-year-old Clark was a college dropout who dabbled in building boats and playing folk music in Houston. Van Zandt was 19 at the time, a scrawny, laconic dark-haired kid with a dry wit. When Clark first met him, Van Zandt had only written two songs, “I’ll Be Here in the Morning” and “Turnstyled, Junkpiled,” but they were enough to give Clark a whole new perspective on songwriting. He had always assumed that folk songs were so old that no one could remember writing them and that pop songs were so silly that no one gave much thought to writing them. “The first time I heard Townes, I went, ‘Wow!’” Clark remembered. “Here was someone who was writing new songs that weren’t talking about girls and beer in moon-June rhymes. There was something intelligent about the way he used the English language. I said to myself, ‘Here’s a reason to write a song.’ I started writing the day I met him. Clark was divorced and working as an art director at the CBS station in Houston when he met his future wife Susanna at the end of 1969. She told him, “Look, if you’re going to be a songwriter, be a songwriter. Don’t dabble at it and then spend the rest of your life wondering what might have been.” With that challenge ringing in his ears, Guy moved to L.A. and brought Susanna with him. “We were living in this garage apartment in this straight neighborhood in Long Beach,” Clark explained. “We woke up one morning to the sound of the landlord chopping down this beautiful grapefruit tree, and my first reaction was, ‘Pack up all the dishes.’ It sounded like a line in a song, so I wrote it down. Just about the only discipline I have as a songwriter is to write down an idea as soon as I have it. You wind up with a stack of bar napkins, and the real work comes the next day or week when you sit down and go through them to see if any of them makes any sense. The Clarks had moved to Nashville in 1971 because Guy had finally landed a publishing deal with RCA. Soon he and Susanna were newlyweds with the irascible Van Zandt as a house guest. The parties at the house became legendary as the likes of Emmylou Harris, Rodney Crowell, Steve Earle, David Olney, Jerry Jeff Walker, Mickey Newbury and Vince Gill would pass around a jug of wine and take turns singing their latest songs. No one knew who they were at the time, but they were getting the best training a songwriter could hope for. And it paid off in the long run, for this crowd supplied country radio with its best songs of the 1980s. Clark’s songs were soon at the top of the country charts: “She’s Crazy for Leavin’” (Rodney Crowell), “Heartbroke” (Ricky Skaggs), “New Cut Road” (Bobby Bare) and “Oklahoma Borderline” (Vince Gill). Clark also had songs recorded by Johnny Cash, Willie Nelson, Lyle Lovett, Waylon Jennings, George Strait, Tom Waits, Patty Loveless, Nanci Griffith, Rosanne Cash, Brad Paisley, Alan Jackson, Kenny Chesney, Joe Ely, Emmylou Harris and Townes Van Zandt. Van Zandt died in 1997, Susanna in 2012. 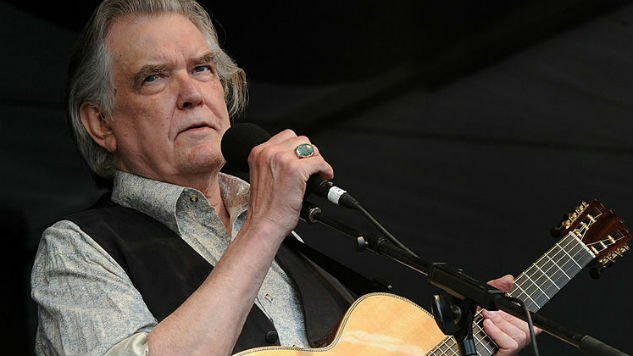 Guy Clark released his last major-label album in 1995, but he enjoyed a rewarding second career as a well-respected songwriter who more-famous singers were eager to interpret and/or co-write with. The swept-back dark hair above his high cheekbones that had once made him look like a rodeo star had turned silver, making him look more like a Civil War senator. For as long as he stayed healthy, Clark continued to tour, performing from one of the greatest song catalogs of his generation, most often with his other best friend, Verlon Thompson. For all his success in Nashville and in the country field, Clark never thought of himself as a country artist. He always thought of himself as a folk-blues artist in the tradition of Van Zandt and Bob Dylan. In his mind, he wasn’t writing for country radio, he was writing—and constantly re-writing—to get that sought-after nod from Van Zandt. On the other hand, he came from a small town in West Texas, and he could never escape those roots.